Schooling: Attended Mt. Olive Grade School and graduated from Mt. Olive High School with the Class of 1942. Church: Devoted member of the 1st United Methodist Church, Mt. Olive. Served as financial secretary for 43 years. Taught Sunday School and Bible School for 25 years. Occupation: Macoupin County General Assistance Office for 23 years from 1970 - 1993 until her retirement. Before her marriage, during the War, she was employed as secretary in the head office by Finke Realty, St. Louis, MO. 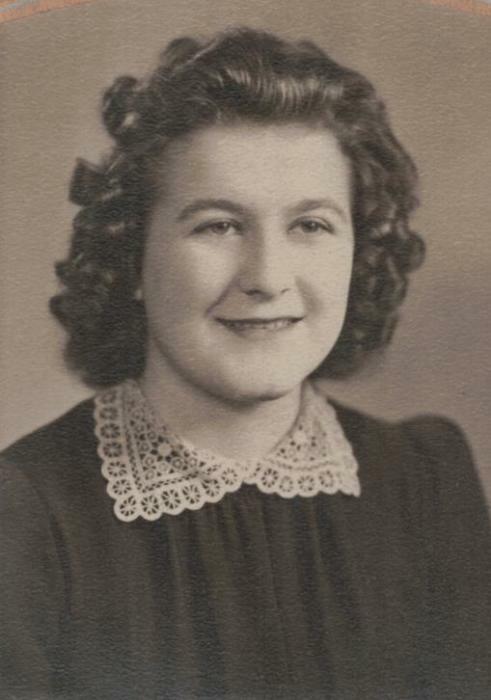 Interests: Esther enjoyed a lively game of pinochle, catching a movie and meal with her best friend "Cookie", Tuesdays were reserved for her brother Kenny. She enjoyed dancing , ice and roller skating, the St. Louis Cardinals , and Elvis. Her family enjoyed the many wonderful German meals she prepared and her famous chicken rice soup, that was a sure cure for a cold. Survivors: 1 Son: Allan (Lisa) Haenel of Staunton, IL // 3 Daughters: Jane (Don) McCarty of Glencoe, MO // Sandra (Gerry) Barrick of Brandon, MS // Karen (Glenn)) Fajardo of Staunton, IL // Sister-in-law: Maxine Bauer of East Alton,, IL // 11 Grandchildren and 8 Great Grandchildren. Lunch: for family and friends will be held at the 1st United Methodist Church Fellowship Hall served by the Methodist ladies . Becker and Son Funeral Home is in charge of arrangements.